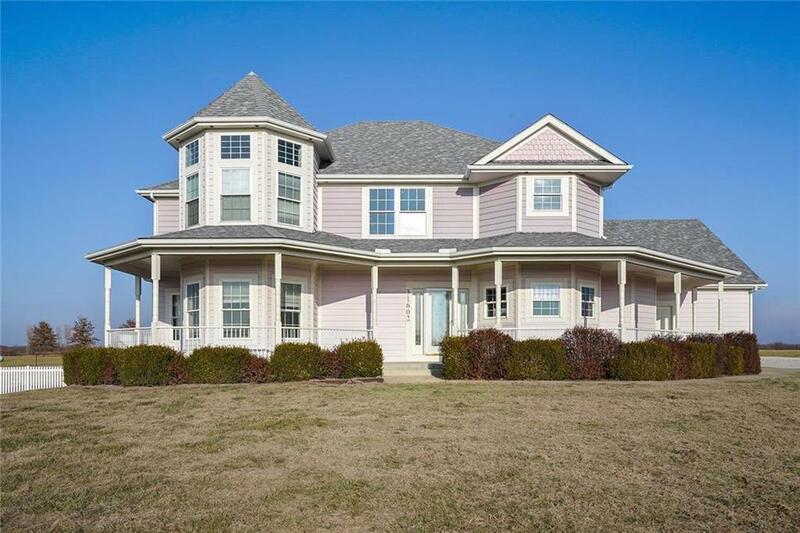 Grand house on just under 6 acres just outside the city with no gravel roads. Price reduced and sellers offering an allowance for carpet/paint. Super efficient zoned geothermal heating & cooling system, new roof, soaring ceilings, & beautiful trim. Master suite on the main floor, huge semi-finished bonus area above the garage, large bedroom closets, big kitchen with w/i pantry, wrap around porch, 2 water heaters, gas & water hook-ups at outside patio. 40X60 outbuilding with 40 amp RV plug-in & stubbed for bathroom. Directions: GPS may take you to the wrong 158th Street in Pleasant Hill. From 50 Hwy travel south on 7 towards Pleasant Hill. Turn left/south on County Line Road. Turn right on Henry Andrews Drive and follow around the curve to home, on the left. Corner of Henry Andrews and 158th in Bay Hill Estates.